On Wednesday, the State Troopers put out their most recent data on illegal drugs trafficking through Alaska. The annual drug report suggests the state is dealing with a one-two punch of growing demand amid declining resources for police and substance abuse treatment. AST is pointing to its partnerships with other law enforcement agencies as a strategy for filling in gaps. At a press conference in Anchorage, Capt. Michael Duxbury summarized the 2017 Drug Report’s key points. To either side of the lectern were charts of drug confiscation trends, as well as pictures of heroin and the powerful synthetic opioid Fentanyl. 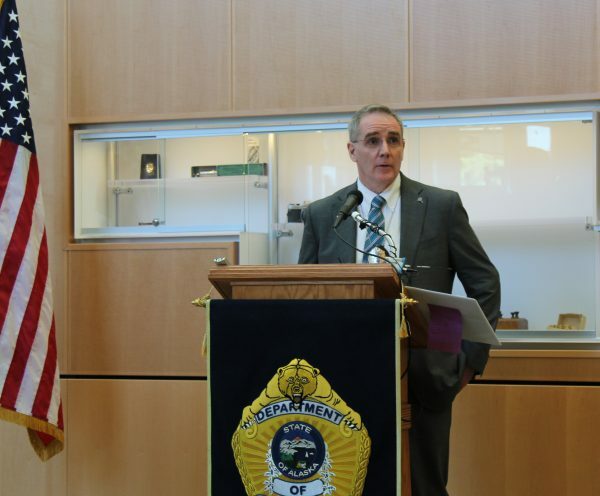 In his nearly three decades with the Troopers, Duxbury says law enforcement is seizing and unprecedented the volume of hard drugs law nowadays. From 2016 to 2017, the amount of heroin intercepted by police doubled. And those seizures represent only a small sample of drugs in the state. Officials are increasingly using the term “poly-drug use” to describe people regularly consuming multiple mood-altering substances. Though the Walker Administration issued a disaster declaration over the opioid crisis, Duxbury points out there was also a five-fold increase in the amount of methamphetamine seized this last year. “The opioid in the state of Alaska is the conduit for talking about the poly-drug use problem that we have,” Duxbury said. The Department of Public Safety is having problems of its own. As of August, 50 of the 389 approved Trooper positions are vacant, more than an eighth. Financial cuts have limited travel to investigate cases, particularly in rural areas. And there are fewer state prosecutors to try cases. In response, the Troopers have ramped up their collaborations with other federal, state and local partners. That means other law enforcement agencies, but also civilian and private sector entities in places where most drugs enter communities. “It is happening in the airports, it is happening in the ports that are bringing it to Alaska, and it happens also in the mail,” Duxbury said of how drugs reach the state and move through it. In spite of expanding problems with hard drugs, AST’s 2017 report notes that alcohol remains the most prevalent substance of abuse contributing to death of Alaskans. State public health officials note that double the number of people died last year from alcohol-related causes as opioids or meth combined.